So how does this relate to and have any impact on your participation in this challenge? 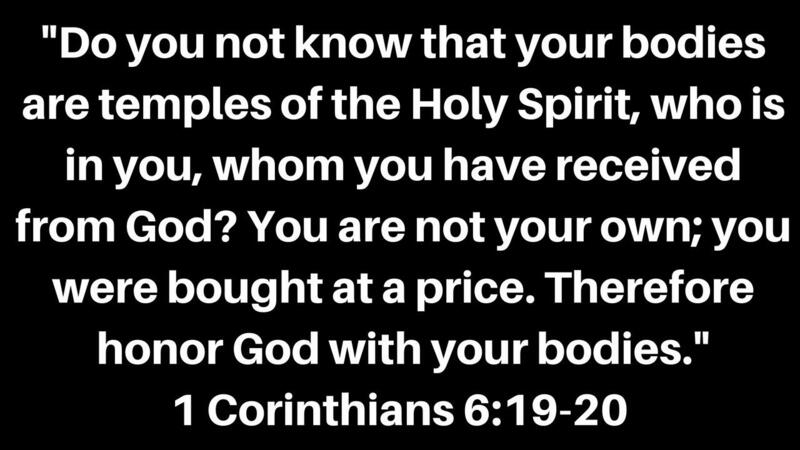 In 1 Corinthians 6:19-20 Paul states "Do you not know that your bodies are temples of the Holy Spirit, who is in you, whom you have received from God? You are not your own; you were bought at a price. Therefore honor God with your bodies." Though Paul's specific context in that writing deals with the immorality influencing the Corinthian believers at the time, I think we can take from that the truth that there is an expectation from God that we care for and treat with respect the physical body he has given us. Our physical body is an outward and visible expression of the state of our inward being. If we have the Holy Spirit within us, should we not be intentional and mindful of the care (or lack thereof) we give in stewarding this resource? As a follower of Christ, is it not our responsibility to continually prepare ourselves to be called into service? And when we are called would we not be able to give more of ourselves if we are healthy? Should we be ok with limitations due to a lack of energy, mental focus, positive mindset, or ability to physically give our best. Or should we consider it part of our discipleship and stewardship to not only continually prepare ourselves spiritually and financially, but also physically? The state of our physical health directly impacts the state of our mental and emotional health; and are we not called as followers of Christ to be completely surrendered in all things? 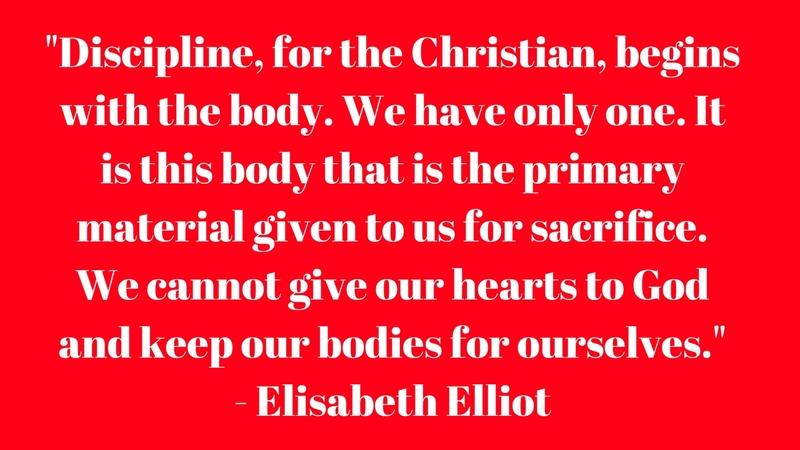 Consider this quote from Elisabeth Elliot, "Discipline, for the Christian, begins with the body. We have only one. It is this body that is the primary material given to us for sacrifice. We cannot give our hearts to God and keep our bodies for ourselves." Meditate on this thought and use it as an opportunity to develop a mindset that aligns the physical care you give your body with the spiritual care you give your soul. Though our physical existence is now finite, we are none the less given the responsibility to be good stewards of God's creation and the culmination of that is man and the body we were given. May it be that we desire to prepare ourselves and in all ways be Fit For Service to others and to the kingdom of Heaven. *This post is part of a Spiritually Speaking series included in the free ERA (Eliminate-Reduce-Add) Health Challenge. Need to get started on healthier living? Learn more HERE!! *If you enjoyed this and would like to pursue a deeper dive into living a lifestyle that helps you be your best to give your best when Christ calls you to serve, consider joining our Fit For Service community. You can learn more at www.FitForService.us.